Not only has the Queen been in town but we were also joined by the President of the United States, Barrack Obama and the Russian President, Vladimir Putin although apparently the two aren’t too keen on each other at the moment! Even our own Governor General Jerry Mateparae was in town to join the D Day commemorations at Normandy. 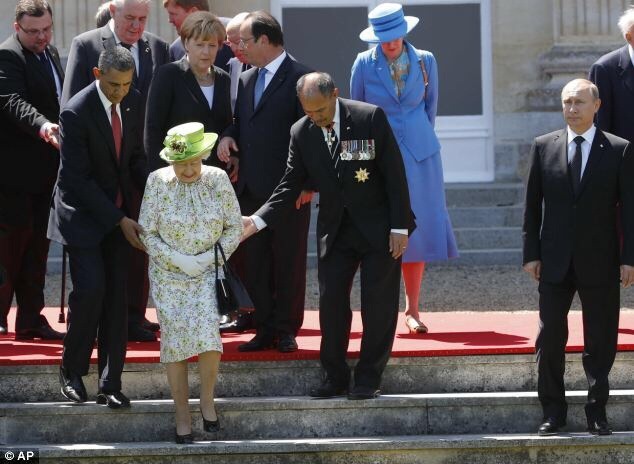 He can be seen in the photo below assisting the Queen along with President Obama. 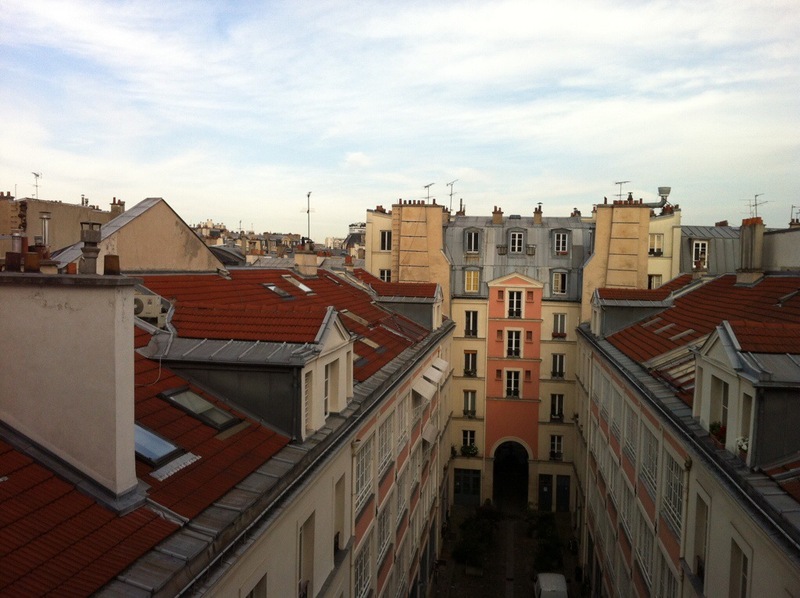 We have spent the last couple of days continuing to explore Paris – as I have said before there is so much to see both in historic buildings and monuments but also just in observing everyday Parisian life. We went to the Eiffel Tower yesterday where Steve & Mel went all the way to the top. Carol got to the 2nd floor. 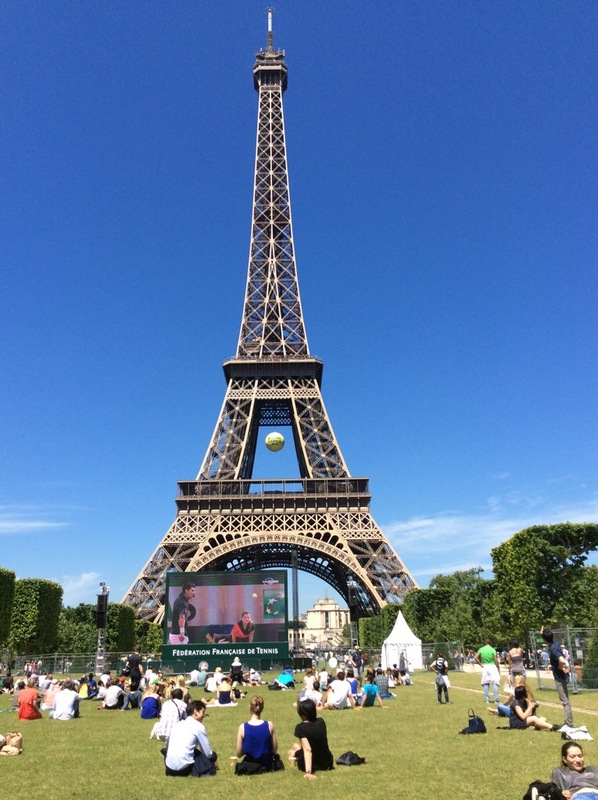 Steve & I decided to go and watch the tennis on the big screen they had set up just below the Eiffel Tower and have our lunch. It was a very hot day so we didn’t last the whole match. We took the Batobus back to our apartment and prepared a dinner of roast lamb and roast veges. 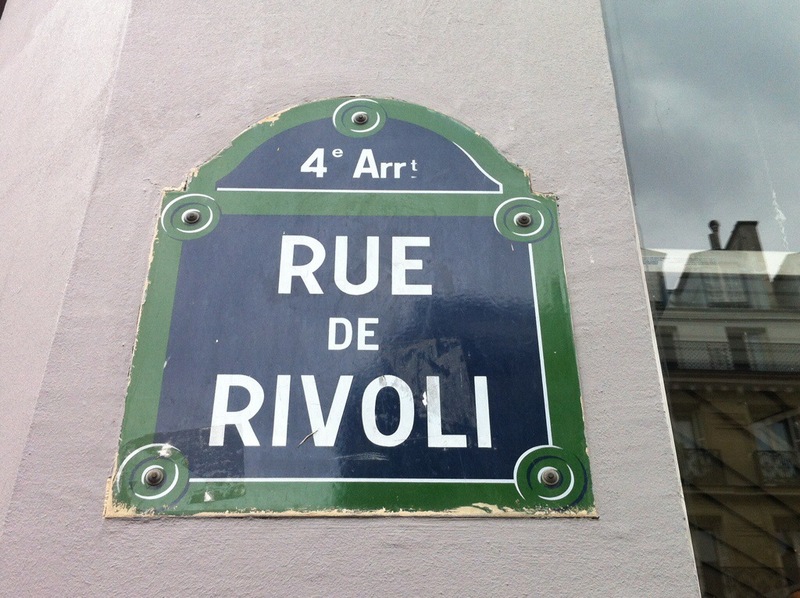 This morning we decided to go the Rue de Rivoli. The Rue de Rivoli is one of the most prominent commercial streets in Paris that runs parallel to Tuileries Gardens and the Louvre museum. The street is renown for shops which carry the most fashionable name brands in the world. The ‘Rue de Rivoli’ name is connected to Napoleon’s 18th-century victory over the Austrian army in the battle of Rivoli. 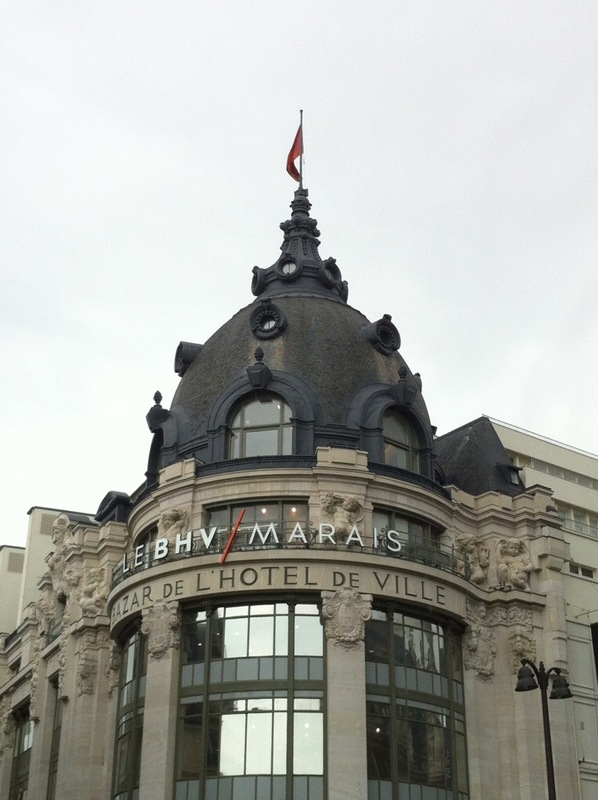 I visited the tea department in the LE BHV Marais Department Store. They stock the Kusmi tea brand. 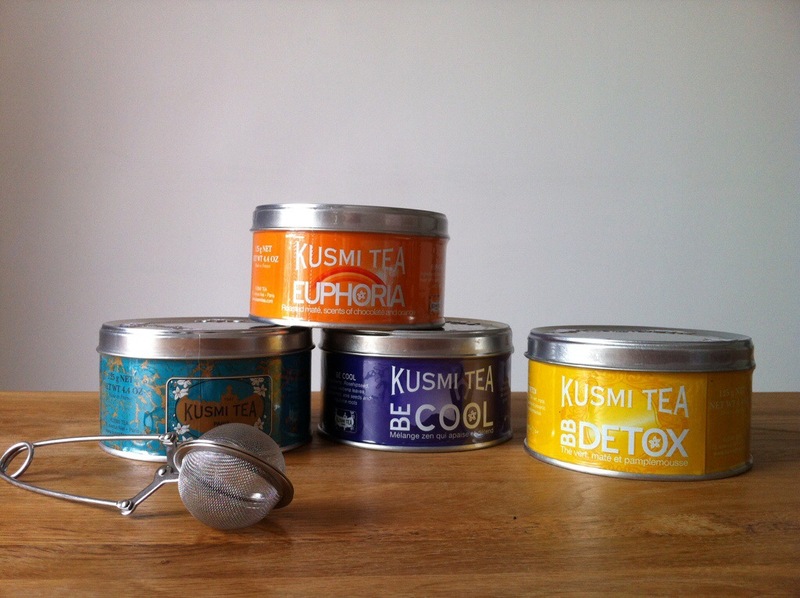 Kusmi Tea is a brand of tea with headquarters in Paris, France. The company, which produces Russian-style teas and tea blends, was established by Pavel Michailovitch Kousmichoff in 1867 in St. Petersburg, Russia. Upon the onset of the Russian Revolution in 1917, the Kousmichoff company relocated to France. The company has changed hands several times since then. The company sells and markets a wide variety of blended and flavoured teas. Kusmi Tea’s Russian teas are blends of Chinese, Indian, and Ceylon teas, often flavored with bergamot, citrus fruits, cinnamon, or other scents. You could smell each of the teas in little sample tins and they smelt divine so I purchased a few to keep me going over the next wee while. 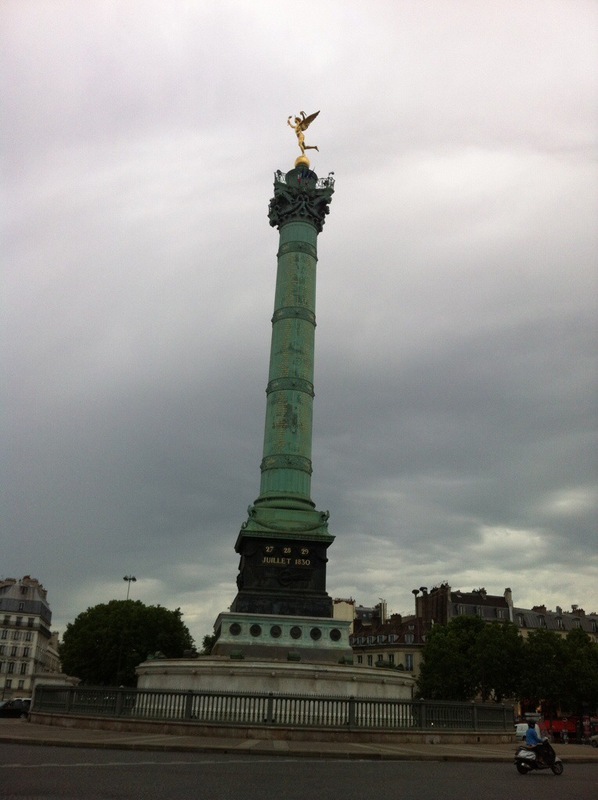 We passed by the July Monument in the middle of Bastille. Place de la Bastille is one of the more well-known squares in Paris and occupies an important place in French history. This is where the Bastille Prison stood until 1789, when this ‘symbol of royalist tyranny’ was stormed on July 14 during the French Revolution. No trace of the Bastille prison remains but the square is still a place where Parisians go to raise their voices in political protest. In the middle of the square stands the July column, commemorating the three-day July Revolution of 1830. yet another overthrowing of a French king. 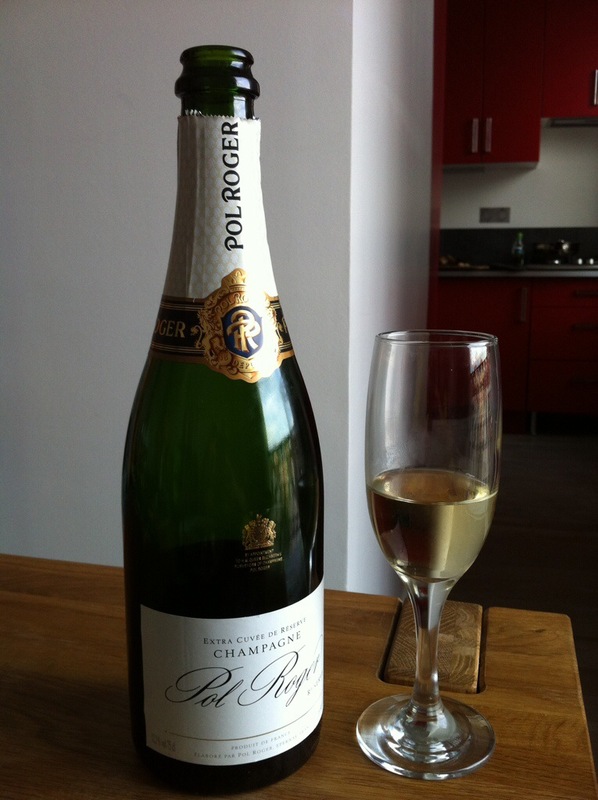 We are now on the train – destination Barcelona.